Click on this link if you need more information about a Chart Recorder. 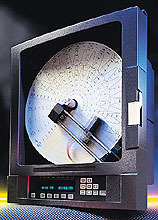 The CT9000 microprocessor-based circular recorder offers one to four trends with one colour per channel. The latter allows future trend addition upgrades and improves chart annotation of times, dates, scale values, trend line tags, and user configurable real time actuated chart messages. The instrument can have up to eight inputs. Some inputs do not have to be associated with the trend pens, i.e. display only. Up to four process values can be displayed on the 40-character vacuum fluorescent display at one time (2 lines of 20 characters each). Full English prompts allow easy configuration of the unit. Using proven dotting head print technology, there is no time difference on the chart between trend lines. This feature, along with the straight radial time line (compared to the curved lines on other recorders) allows for more accurate reading of data. The unit uses plain paper charts with pre-printed rings to further enhance readability and provide better long-term storage. Note: Recorder comes complete with a pkg of charts, pen cartridge and operator’s manual.